Granite is formed over millions of years from compressed molten rock under the Earth's surface. Because of this, granite is very hard and durable making it resistant to both scratching and chipping. 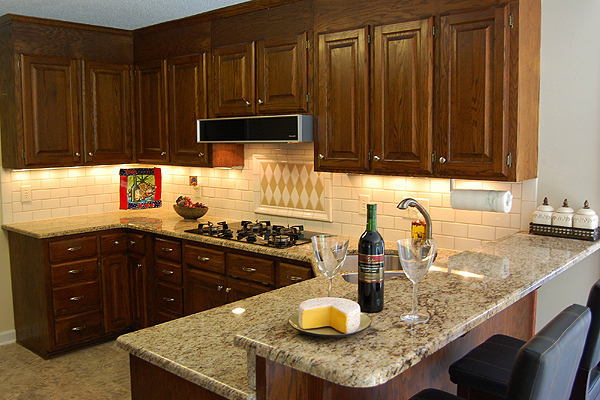 Additionally granite is very heat resistant; more so than both quartz and marble. Granite is made up of interlocking mineral crystals, the most common being feldspar and quartz. But an array of other minerals can be included, and these make each piece of granite unique. Granite is blasted and drilled out of the ground in blocks at quarries throughout the world and brought into the united states by stone slab distributors. These slab distributors sell to fabricators like World Stone the material we use to fabricate your granite countertops. Marble, like granite, is a formed over millions of years from compressed molten rock and is extracted in blocks from a quarry. However, for various reasons, marble is not as hard as granite and is more porous than granite. Therefore marble is much more susceptible to staining as well as scratching and chipping. World Stone does not recommend using marble counter tops a kitchen. Instead marble counter tops are better suited for bathrooms where there is less exposure to heavily acidic or basic chemicals that may damage the stone. Quartz is a man made product manufactured by a machine that compresses resin and quartz into approximately 10' x 5' x 1.25" slabs. The manufacturing process and, for the most part, the actual machine used to manufacture quartz is the same. Quartz manufacturers therefore differentiate themselves on what they put into the slabs; namely the quality of quartz used, the colors of the material, and most importantly the consistency and control over the materials used during the manufacturing process. Not all quartz is created equally. Below is a link to the quartz manufactures that we recommend and buy from.